Are you struggling to find the perfect gift for your wife or daughter this year? Growing up, I remember one of my mom’s favorite gifts she got over the years was her gold dipped rose. She would display it during the holidays and kept it in a special box throughout the year. Like my mom, I truly love roses and it is a special treat to buy them and display during throughout the years depending on the available colors. My big issues with roses, however, is that they do wilt and die, the biggest reason I rarely ask for them. 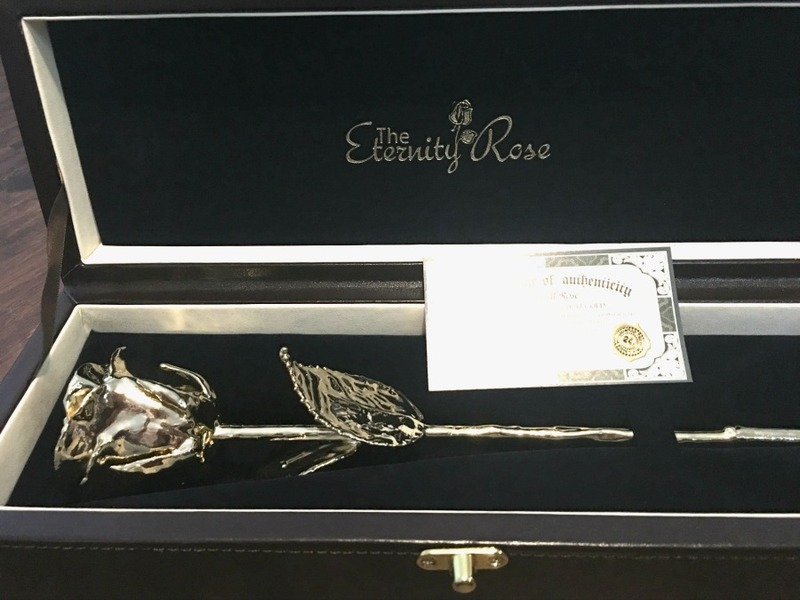 Recently though, I was happily surprised when I learned that a company made a more beautiful version of the gold rose I knew growing up – Eternity Rose. 24k Gold-Dipped Natural Rose from Eternity Rose: What is It? Are you looking for a truly unique gift for someone you love? If so, we think you will love the 24k Gold-Dipped Natural Rose from Eternity Rose. 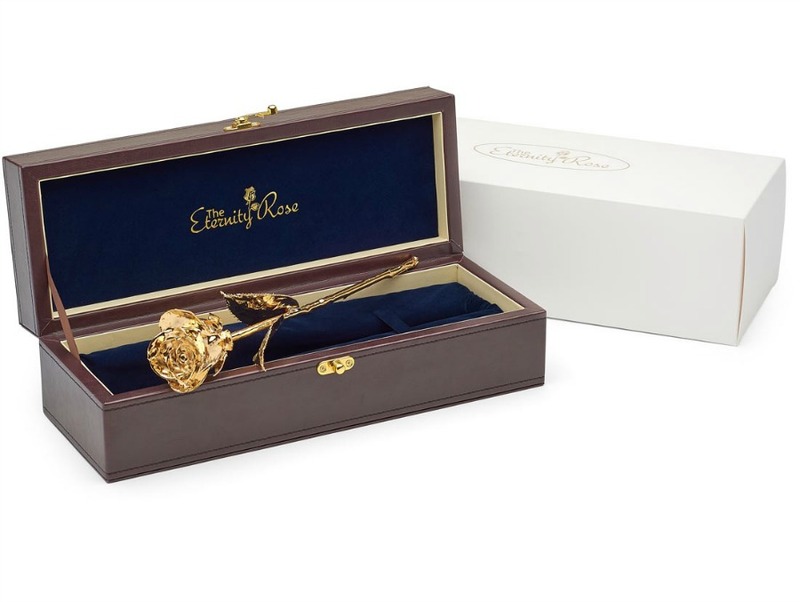 Unlike most roses that wither away and die, this rose combines the beauty of a rose and majesty of fine gold to give your loved one a gift that keeps giving, and will never fade. This 11.5 inch gold rose is an actual, natural rose that was dipped in 24 karat gold, and comes with a certificate of authenticity. With its brilliant gold finish and exquisite leather case, it is an ideal gift of art that she can display throughout the year. Best of all, she will love it anytime during the year, making it the perfect gift for Christmas, Valentine’s Day, or even anniversaries! Want to see a close up of this beautiful rose? Make sure to check out the video below! I will freely admit, I was in awe when I first opened the box and saw this beautiful rose. I expected it to be beautiful, but I was still quite amazed seeing the gorgeous rose in its nice box. It really is meant to be displayed, especially with how it shines. What surprised me the most was just how durable it felt (they explain the process on their website they use for dipping the roses to make them more strong and stable). Along with looking like a real rose (since it is underneath the gold), I love that it will never wilt or fade, allowing me to enjoy this special rose throughout the year. Honestly, I can’t imagine any woman who wouldn’t love opening this box on Christmas morning, or finding it wrapped up for Valentine’s Day! 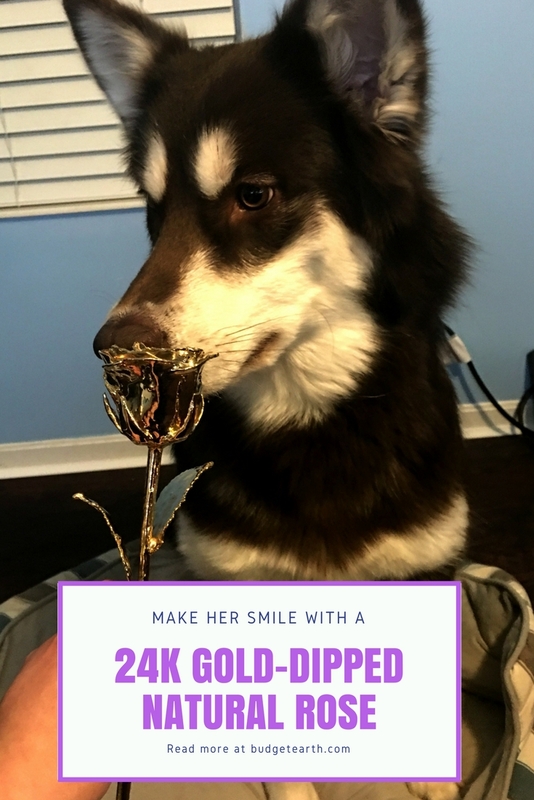 24k Gold-Dipped Natural Rose from Eternity Rose: Where to Purchase? Want to purchase this gorgeous rose for someone special in your life? You can buy the 24k Gold-Dipped Natural Rose and other gift ideas she will love at the Eternity Rose website. Want to learn more? Check out Eternity Rose on social media! What a gorgeous rose! Although, I would display it all year long. That does look beautiful. I like roses. How gorgeous!! A rose that never dies too!! I mean really the best gift for a lifetime!! This would be the highlight of a Beauty and The Beast-themed gift! How awesome would that be! I have seen these and matter of fact had one! We went to an auction years ago and it was in a box. It really is quite pretty. I later gave it to my niece who loves it and keeps it on her dresser. Those are so pretty! They would make a lovely holiday gift! I have one of these from my husband. It’s so pretty and it came with a pretty crystal vase. I keep it in my hutch in the dining room. That is really pretty! I have never seen something like this before. It’s pretty. Not very practical, but nice. Sweet, quite a unique gift. This would be such a nice gift, it is something you probably don’t get for yourself. It would be so pretty on a mirror on a vanity, or just kept in a special place for your keepsakes!